Well, it’s snowing again. Yesterday morning it tried to snow and ended up raining most of the day. It’s supposed to be in the low to mid forties for most of the week. This morning we got up and there was about two inches of very wet snow on the ground. And it’s still snowing. Of course. Because we’ve been planning to BBQ since Saturday and because the kiwi unlocked his hubs yesterday. I still think most of this will be gone by mid-day, but we’ll see. Yesterday it kept trying to snow even when the temperature got up to 37 F. It’s currently 33 F.
In other news, I got a couple of those gamma seal bucket lids the Commander raves about. We got a big bag of rice that’s gonna go into one of those buckets as soon as I can get the bucket cleaned up and the lid on. 1. Preheat the oven to 350 degrees F (175 degrees C). Grease and flour a 10 inch Bundt pan or 9 inch tube pan. 2. In a large bowl, cream together the butter and white sugar until smooth. Beat in the eggs one at a time, mixing well after each, then stir in the vanilla. Combine the flour, baking soda, salt, and mace; mix into the batter just until smooth. Stir in sour cream. Spoon batter into the prepared pan, and spread evenly. 3. Bake for 1 hour and 20 minutes in the preheated oven. Cool for at least 10 minutes before inverting pan onto a plate, and tapping out the cake. Dust with confectioners’ sugar before serving. A friend sent me this link. This guy is amazing! Since the kiwi and I just shoveled show, it’s decided to start snowing harder But I do like the snow. Let’s see… Monday and Tuesday I worked ALL. DAY. LONG. Then the office manager was back and I worked a half day on Wednesday to get caught up. The cat got her stitches out yesterday and I had to shovel snow twice. It didn’t snow at all last night though. Today I will be paying bills and baking bread (or making the dough anyway). Tomorrow is the Grizzly Dip and Sunday is the SB. We’ll probably go out to my folks for that. Next week, I have a couple of doctor appointments. Then starting on Friday, I have to work seven full days! It really exhausts me for some reason. And yes, our office is open on President’s day so I will be working all day that day. Our friend, Phil is coming out to visit that weekend too so we’ll probably end up skiing that weekend. I’m getting tired thinking about it. Now I think you are all caught up with my schedule. By the end of the batch they were starting to look good. Still not perfect, but I think I’m starting to get the idea. I’ll post more about them, but you can compare the picture to the other one I posted. Yesterday evening it started snowing. Then it promptly turned into rain. So, it rained last night and a lot of the snow is now gone. The temperature is about 37 degrees right now. This also left the driveway as one big sheet of ice. The kiwi went out this morning to get the paper and had to use a lot of deicer to get there. I’m sure the roads are really fun this morning. Now for the cooking. Yesterday the kiwi broke into a package of crumpets that he managed to obtain. So we got to thinking about what a pain it is to find any crumpets in this town and I hit the intarwebs to find out if it was something I could attempt to make at home. Well it seemed like it might be pretty simple but I didn’t have any crumpet rings. You see, crumpets are made from a yeast batter that you cook on a griddle using rings to contain the batter. 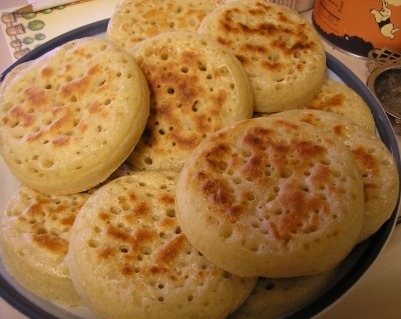 In fact, crumpets are almost the same batter and preparation method as you use for English muffins. The difference is that the crumpets have a thinner batter. OK, so I need to find some crumpet rings. My favorite King Arthur Flour: Baker’s Catalog have them, but they are out of stock. Amazon, Sur la Table and Williams Sonoma have them too but they are all pretty pricey and the shipping costs were high. So off to the local stores to see what they have. I read that egg rings are the same diameter and will work fine for the job. Long story short, we found them at the third store we looked in. So I’m all set to go. After dinner I attempted to make the recipe I found here. I halved the recipe since this is experimental. After the batter rose, I heated up the skillet and the rings and then plopped the batter in. Bottom line, the holes did not form on the top very well and what I ended up with looked more like and English muffin. I think the batter was a bit too thick and I perhaps put too much in the ring. I tried to toast them this morning like an English muffin but the tasted very yeasty and not really like an English muffin. This morning I am attempting it again using the recipe I found on KAF. I hope this batter is a bit thinner. I will also not fill the rings quite as much. Again making a half recipe. We’ll see how this goes. And I just found this recipe which may confirm my question about the batter consistency. Hmmmm. It’s been almost a week since I posted about all that snow. As it has been for a lot of places lately, it’s been bloody cold here! I got my bread baked on Friday and then on Saturday I made dinner rolls but I forgot about them and they did the second proof for about twice as long as they should have. They came out tasting good, but looking almost big enough to be hamburger buns. On Sunday we went out for dinner at the only Indian food place between here and Spokane. They only recently added meat to their menu. I didn’t care much for it but the kiwi seemed to really enjoy his. I suspect he’s been deprived too long. The only meat available was chicken or fish. And the chicken in my dish seemed not to be cooked with the dish but added at the end. No lamb. They had no Vindaloo on the menu. No Tikka Masala, no Korma, no Tandoori. And the Naan seemed like it was done with whatever they make Papadum with only thicker and fried in a pan. The one good thing to me were the Samosas. Then we get home and find out that Green Bay lost Grrr. I have been working part-time at an audiology office filing and such. On Sunday, I got a call to come in for a full day on Monday as the office manager was going to be out. So, I worked my first full day on Monday and one of the audiologists was out sick to boot. I survived and get to do it again this Monday and Tuesday. Then again for a full week in February when the office manager is on vacation. On Monday I also took Shasta to the vet to be spayed. She was so happy to see me on Tuesday morning when I picked her up. She probably thought we had abandoned her. She’s back to running around all over the place but wants to chew on her stitches now and again. She’ll get them out maybe by the 1st. So, I now have the driveway shoveled (for all the good that does). It’s still snowing. Mark did surgery on the Roomba last night1 and it’s all charged up. It had a test run this morning and now seems to be working just fine. Shasta likes to follow it around. She doesn’t seem afraid at all. Casper used to hide under the bed in the other room even for the Roomba. Now I need to get some tunes on and get organized to bake bread I also need to do a few household chores. Perhaps a trip somewhere to frolic in the snow is in order too! 1The Roomba has been dead for the last year and a half. It wouldn’t hold a charge. Mark finally bought a new battery only to discover that that wasn’t the problem. It needed a new mother board which he just purchased on eBay. This is a Flickr badge showing public photos from Lab Rat. Make your own badge here.